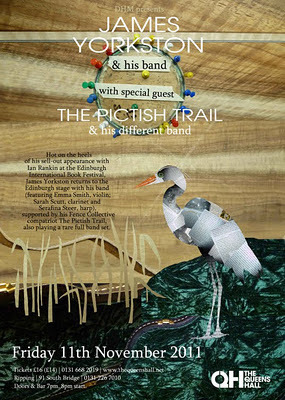 I did this last-minute poster for a James Yorkston/Pictish Trail gig at the Queens Hall in Edinburgh this month. 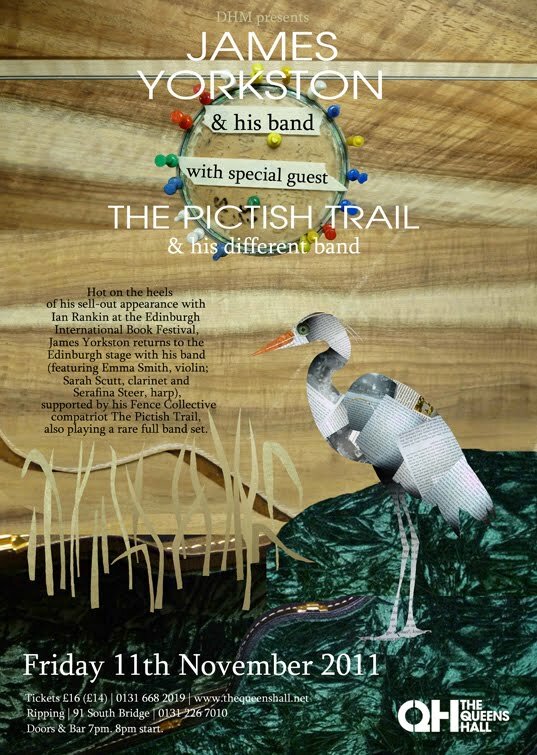 The heron is collaged from pages of Yorkston's highly recommended collection of tour reminscences, It's Lovely To Be Here. The pages cut up real nice. Originally there was a cowboy Jesus (?) as part of the heron's beak, but it looked better without it. There is a weird painting of a donkey in there somewhere though. The background elements are all taken from a Facebook gallery chronicling the custom-build of James' new guitar. But it probably just looks like I got some photographs of some chipboard and some scrunched up Quality Street wrappers, I know.